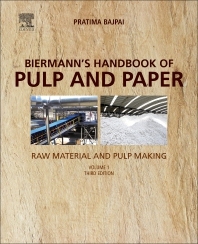 Biermann's Handbook of Pulp and Paper: Raw Material and Pulp Making, Third Edition is a comprehensive reference for industry and academia covering the entire gamut of pulping technology. This book provides a thorough introduction to the entire technology of pulp manufacture; features chapters covering all aspects of pulping from wood handling at the mill site through pulping and bleaching and pulp drying. It also includes a discussion on bleaching chemicals, recovery of pulping spent liquors and regeneration of chemicals used and the manufacture of side products. The secondary fiber recovery and utilization and current advances like organosolv pulping and attempts to close the cycle in bleaching plants are also included. Hundreds of illustrations, charts, and tables help the reader grasp the concepts being presented. This book will provide professionals in the field with the most up-to-date and comprehensive information on the state-of- the-art techniques and aspects involved in pulp making. It has been updated, revised and extended. Alongside the traditional aspects of pulping and papermaking processes, this book also focuses on biotechnological methods, which is the distinguishing feature of this book. It includes wood-based products and chemicals, production of dissolving pulp, hexenuronic acid removal, alternative chemical recovery processes, forest products biorefinery. The most significant changes in the areas of raw material preparation and handling, pulping and recycled fiber have been included. A total of 11 new chapters have been added. This handbook is essential reading for all chemists and engineers in the paper and pulp industry.